Presentation on adapting to new co2 injection well regulations, given at Lodz, Poland. The report focuses on the transportation of carbon dioxide (CO2) through pipelines from a "source" to a geologic "sink," the possibility of a federal mandate requiring capture and storage of CO2, and provides an overview of carbon capture drivers, the geologic means of storing CO2. It also describes the nature, size, and location of the significant CO2 pipeline system currently operating in the United States. It describes the state and federal regulatory regime, under which the current CO2 pipeline system operates. An analysis is made of the regulation of CO2 pipeline systems under the Interstate Commerce Act and the Natural Gas Act and potential business models for future CO2 pipeline build-out. Potential regulatory models are described and there is discussion of economic issues relative to future construction of CO2 pipelines. 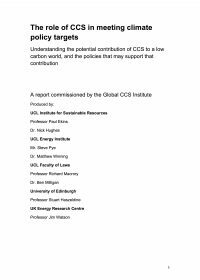 Conclusions and recommendations suggest that the market is repsonding to current CO2 pipeline construction demand. Conclusions recommend that future market response to those needs occur with limited federal intervention.